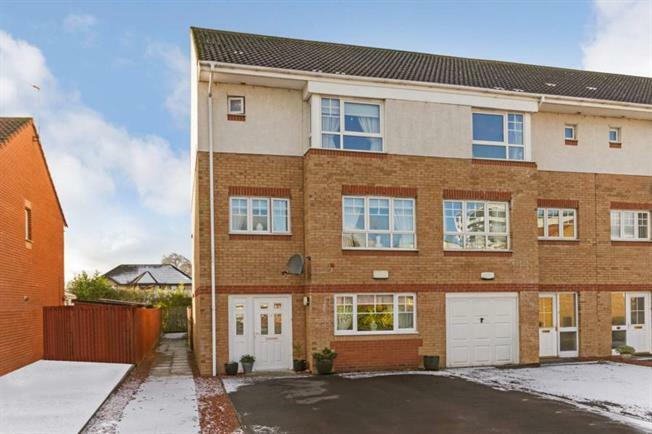 4 Bedroom End of Terrace House For Sale in Glasgow for Offers Over £225,000. Located in a much admired and sought-after modern development close to the centre of Stepps, this is an excellent opportunity to acquire a modern end terraced townhouse which offers flexible living accommodation over three levels and is located within close proximity to local amenities, including Stepps train station, local schools and shops. The accommodation on the ground floor comprises a welcoming reception hallway, two beautifully presented double sized bedrooms, modern shower room and a utility room with an outer door to the rear garden. On the first floor there is a bright and spacious formal lounge which has been immaculately presented with modern decor and overlooks the front of the property. Also on the first floor to the rear of the property is a well equipped open plan kitchen diner which benefits from a Parisian balcony overlooking the garden to the rear. On the second floor there are two more double sized bedrooms, both benefitting from built in wardrobe storage and the master features a modern en-suite shower room with three-piece suite. Completing the internal accommodation is the modern family bathroom . Further benefits include gas central heating, double glazed windows and ample storage space provided. Externally there is driveway parking available at the front of the property, with the rear garden being more substantial and offering a perimeter fence, large storage shed and timber decking. Early viewing is a must to avoid disappointment and to appreciate the overall size of the property and high quality of finish throughout. EER Band C.